7 weeks to go before my 2nd Camino. I think I'm well prepared. Any tidbits of advice welcome. Discussion in 'Camino Via de la Plata - The Silver Route' started by divergordon, Jan 20, 2013. Last year I walked the Camino Frances from SJPP to Finisterre. I loved it so much that I'm going back in! I've opted for the Via de la Plata for a few reasons; it's longer, i.e. more time on the trail ; it starts in Seville, I've never been there ; I will be forced to speak a lot more espaniol (with the help of a fantastic new offline translator app from jibbigo http://www.jibbigo.com/website/ ) THE BABEL FISH HAS HAPPENED AND ITS ONLY £2.99! ; I will be walking north every day with (hopefully) the sun on my back and not in my eyes . Last year my 35 litre Osprey Talon pack weighed under 6 Kg (without water). This year I'm taking a few more items of clothing since I'm starting mid March and it may get chully! I've also decided to carry coffee, milk powder, tea-bags, sugar, salted peanuts & raisins. Last year I spent a small fortune every day on endless cups of cafe con leché, so I reckon I can save a significant amount of beer money by making my own morning coffee(s). To this end, I have invested in an X-Mug, a collapsable mug/bowl. I have also decided to take my iPad mini. The Via de la Plata app is too-good a resource not to exploit fully. travel game set, cordura bags instead of ziplock bags, soap dish with lid, small mobile (cell) phone. I have been refining the packing list over the last week or so and have settled (for now) on a total of 8Kg (including bumbag). Any way. I just thought I'd share. I found this forum very useful for my prep last year, maybe my contribution will be useful to someone else. I'd take that 3rd pair of socks. They don't weigh much and if you get a few wet days you might be glad of them. Besides, if you're anything like me, you'll probably lose at least one. Also, ear plugs. Good to have and weigh nothing. On the Via you'll be meeting the same people night after night a lot of the time. If you're unlucky and end up walking with some kind of supersonic snoring monster (they do exist!) you'll be sorry you left the ear-plugs at home. Very sorry! That you were lucky last year doesn't mean a thing. Reading material: I always bring a book and never read it. I just can't read on the Camino. I think that part of my brain switches off. I'm sure your translator app will get a few laughs in rural Extremadura! Please report back on how you get on. Thank you for all your observations. Message received. I'll take the extra socks and ear plugs. The iPad mini is loaded with books, podcasts and other entertainments, none of which add to the weight, so it makes sense to take a library when it costs nothing in energy expenditure. The translator app is already giving me some laughs as I play with it. However it pans out, I'm sure to have fun with it. My budget is a bit tighter than last year; €30/day, so I hope to be buying a lot more food from stores, eating al-fresco or in the albergues. I'll be carrying 500g raisins, 500g salted peanuts & about 150g queso, replenished as required. My hope is to be able to top-up my "larder" every few days, and will be on the look out for a decent mercario in every village. I figure that I can save a lot by not having the Peregrino menu every night. I will certainly report back after my return ( or perhaps even during). I think you can manage fine on €30 a day. Accommodation on the Via is cheaper than the Camino Frances and there are far fewer spending opportunities (lots of days you'll walk the whole day without seeing a bar!) You won't actually save that much by cooking for yourself unless you band together with a few other people, then it gets cheaper and easier. Most hostels which have a kitchen have nothing in the way of basic supplies except possibly salt. I always managed on a picnic of break and cheese and yogurt and then something hot in the evenings. Just wondering if you managed to get a good guide for Camino de la Plata. I'm hoping to start in Seville in April and am having difficulty getting a guide of the same standard as the Brierly guides. Any ideas???? Hey Patty - Without reference to the VdlP, let me just offer a comment regarding bedbugs. When I walked the Camino Francés, I didn’t encounter them. Similarly, no bedbug experiences on the Portugués or Inglés at the albergues where I stayed. However, that’s not to say that they’re not out there. My “bedbug” preparation for each Camino included spraying my sleeping bag and backpack with Permethrin. It’s an easy and safe way to add a layer of protection just in case you were to encounter these nasty critters. Here in the States, this repellant is easily purchased at most sporting goods stores or at the large box stores like Walmart. So, as you prepare for your Camino, I’d recommend taking the extra precaution of treating your gear with Permethrin anticipating that you could encounter bedbugs somewhere along your journel. Safe travels and Buen Camino! hindsfeet, Crepes4Suzette and Patty van Hest like this. I also bought the little guidebooks produced by The Confraternity of Saint James – These are very inexpensive and Very Useful and it is often good to have an extra guide so that you can make comparisons. @Patty van Hest when I went on my Caminos, I had the same bed bug experience as @Wily did and took the same precautions. hindsfeet, Crepes4Suzette, Patty van Hest and 1 other person like this. Patty, my wife and I have successfully completed two CFs and are planning our third for next Sept-Oct 2019. With regards to bed bug protection, like Wily we sprayed our backpacks, silk sleep liners and sleeping bags with Permethrin a week before our trip and did not have problems with bed bugs for either camino. Crepes4Suzette, hindsfeet, Patty van Hest and 1 other person like this. Thanks Bob, I may even have something similar already in the cupboard. Never realised that could do the trick. Will look into that! Thanks Bob, I'll look into that. Pretty sure I have something like that in the cupboard already...never thought to use it for bedbugs. Hi Patty, I did the CF and the Ingles this year. 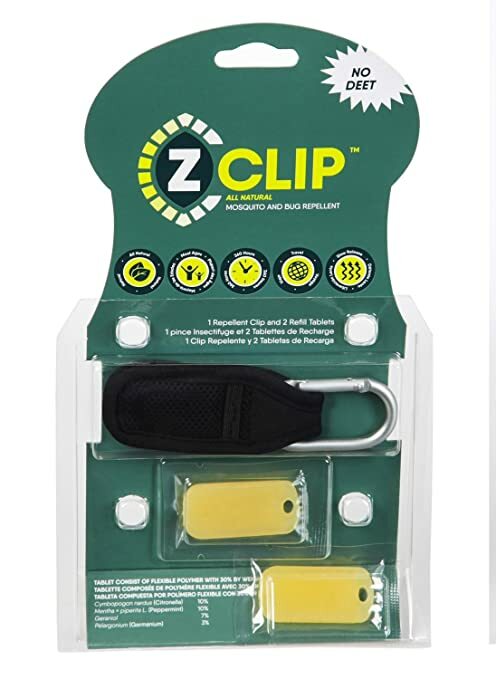 I ordered the Z-CLIP as Bob did, thinking that I would get carried away by mosquitos at least in the woods. I clipped it on my pack. Never even saw one though. I did not use Permethrin either, ( I am so sensitive to chemicals) but never encountered bedbugs along the way. If you fear those creatures....probably is a good idea to use it as highly recommended by the experienced Pilgrims on this site! The gypsy in me has a tendency to throw caution to the wind. UnkleHammy, BROWNCOUNTYBOB, RJS and 1 other person like this. Thanks for the info about Mundicamino, Rob. I just received the UK Confraternity's booklet and am enjoying reading some of the history of the VdlP. Magwood just did the VdlP recently and live-blogged it in her usual interesting and informative way. Laurie/Peregrina 2000 also did a FindPenguins trip blog also recently that would likely be of use. hindsfeet and RJS like this. I also hope that you find the Mundicamino website useful – I used to download and print of the little strip maps as I found these to be incredibly useful. I am sure there are plenty of others including Magwood will be more than happy to help you and, I look forwards to reading about your own adventures on The your Via de la Plata in the not too distant future. hindsfeet, Crepes4Suzette and UnkleHammy like this. Thanks, Rob! That information about the CSJ Website and also about the strip maps on Mundicamino are much appreciated! It sounds like people are leaving as early as April 1, which should make the long wait during winter a little more bearable:0)). Hope you are well and, as usual, thanks for giving of your time to help others! RJS, UnkleHammy and hindsfeet like this. As I have been unable to walk Caminos for the last few years due to a bit of bad luck with my health, I find that trying to help others plan and then hopefully complete their own Camino’s is as near as I can get to being out walking one again myself !! Apologies for the delay. I was on the Camino Frances and I just saw your questions now. What do you mean by "populated". Other pilgrims or local population? Whether you need to carry food for the day depends on the stage. However, it is a good idea to always have something to eat on you because you never know when you'll find bars/shops closed unexpectedly. Re bedbugs. I've never seen or heard of them on the Via. Cold weather gear in April is a good idea. Especially in the mountains it can still be cold. Also raingear is essential. You can download my guide from my website, the address is in my signature. Patty van Hest, hindsfeet and Crepes4Suzette like this. Thanks everyone for your kind replies! I Have 3 Weeks To Pick A Route For My 2nd Camino. Help! Passport online/ will arriive in two weeks?